There is a scene in the 70s cult-classic film Willy Wonka and the Chocolate Factory where Gene Wilder’s Wonka, with the flourish of a flute, introduces the children to his most secret room in the factory: the Inventing Room. Inside, a laboratory of test tubes and vast cauldrons bubble and steam, tomatoes squirt, machines whir, Oompa-Loompas scurry around adding ingredients to the various concoctions. Wonka eventually leads everyone to the shrouded contraption that produces the crowning achievement of his mad science: the everlasting gobstopper. St. Vincent’s Annie Clark has the madness too. And while her science is songcraft instead of candy, the laboratories can’t be that different. Since the release of her debut record, 2006’s Marry Me, she’s proven herself to be something quite different that a mere songwriter of quaint and pretty pop songs. Instead, she mixes and distills the pop, fracturing the pretty and then suturing it back together until its been radically transformed. The result is songs and sounds that take breathtaking and sometimes terrifying shapes, as Ms. Clark is never afraid, like Mr. Wonka, to throw in the proverbial pair of shoes if needed, “For kick!”. Clark is a sonic chemist, Strange Mercy, her latest experiment. Experimental music never sounded like this though. 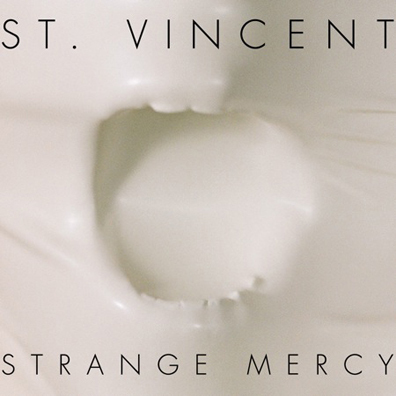 Like St. Vincent’s previous work, Strange Mercy is fresh and punctuated with purpose. Its tangents never evade the listener but surprise and delight. The first single “Cruel” is a bitingly sharp and yet impossibly evanescent anthem that is equal parts Eurythmics and faery princess. “Surgeon”, which opens with a familiar melody (borrowed from John Barry’s theme for the Bond flick, You Only Live Twice), gets swept up half-way through into an Eastern-tinged strings descant and then in the last minute into a “Boogie On Reggae Woman” synth and bass jam. “Cheerleader” offers this chilling just-in-time-9/11 line: “I’ve seen America with no clothes on. I don’t want to be a cheerleader no more”. This is the way that Annie Clark operates: utter beauty and/or devastation. And whether it be in the music or the words, it’s relentless. Strange Mercy is more mysterious than its predecessors, the references more obscure, but it also feels more personal. The regret of resignation on title-track “Strange Mercy” is palpable and the unmentioned ache on album closer “Year of the Tiger” is all the more present in its absence. Like Wonka’s gobstopper, Strange Mercy is as colorful as it is angular. Everlasting? Too be sure.